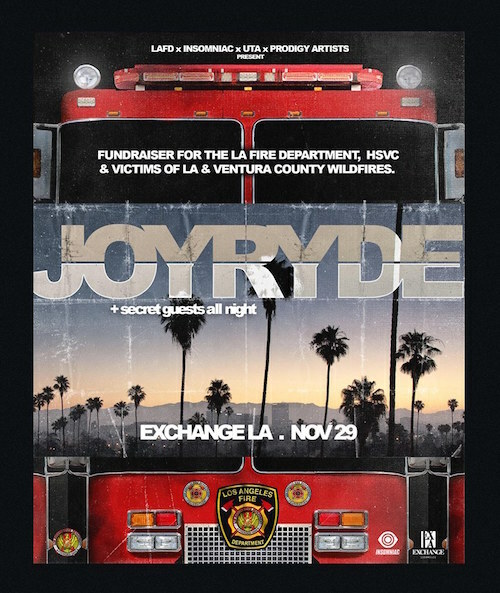 Southern California has been devastated by a number of wildfires recently, and JOYRYDE has decided to put his name to use and organize a fundraiser for the Los Angeles Fire Department, Humane Society of Ventura County, and victims of the Los Angeles County and Ventura County fires. The event will take place this Thursday, November 29th at Exchange in Los Angeles. John Ford has teamed up with Los Angeles Fire Department, Insomniac Events, United Talent Agency, and Prodigy Artists for a benefit show where all proceeds will be donated to support the LAFD, HSVC, and victims of the fires. For those who are unable to go to the show but would still like to donate, the Los Angeles based artist has started a Go Fund Me to support the relief efforts. The United Kingdom native will have a number of secret guests perform throughout the night, making this an event you do not want to miss. Tickets for the 21+ show are $25 with doors opening at 10pm.